To make the tart dough: Place the flour, salt and butter in a food processor. Process until the flout mixture resembles cornmeal. With the machine on, add ice water and process until the dough just begins to stick together. Remove the dough from the processor and press together into a ball. Wrap in plastic and refrigerate for at least 1 hour to 1 day. Roll out the dough on a floured surface into a thin sheet; then transfer the dough to a 10-inch tart pan. Press into the sides of the pan. Brush with the egg white. Preheat the oven to 350 degree F. In a large mixing bowl, using a whisk, beat the eggs well, then beat in the cream. Stir in green onion, basil, garlic, tarragon, nutmeg, and salt. Add half of the grated cheese into the egg mixture and stir in. Place a layer of halved tomatoes across the tart. Pour in the egg and cream mixture until it just rises to the edges of the tart. 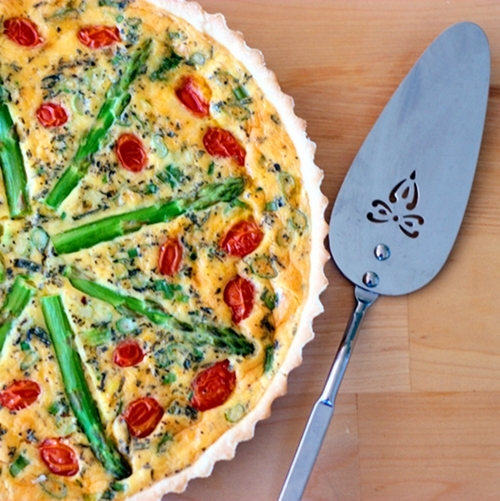 Sprinkle the remaining grated cheese over the tart, and arrange the asparagus across the tart. Sprinkle the chopped parsley all over. Place the tart on a baking sheet and bake in the preheated oven until the tart begins to bubble on the top and lightly brown, about 40 minutes. Remove the tart from the oven, and let cool for 10 minutes. Slice the tart and serve warm. Wow!!! That looks delicious and the colors are beautiful! Can't wait to give it a try! I'm glad every time I hear about a child who is not a picky eater. It seems like there'e a lot of them lately, and I think that's not a good thing. That is SUCH a beautiful tart. 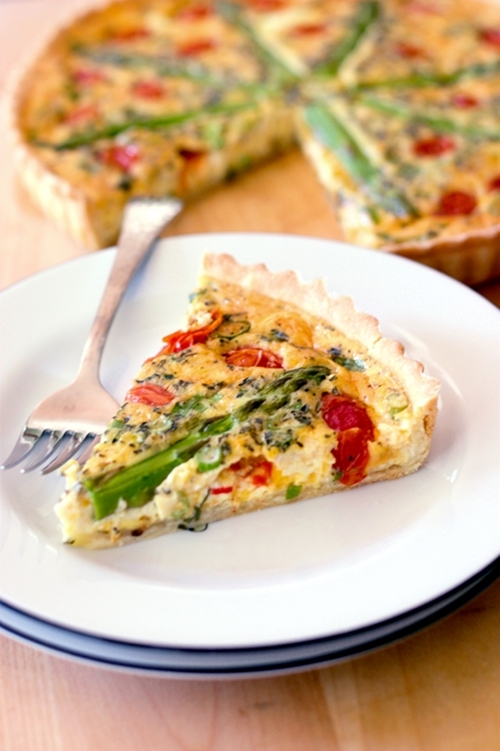 I just love quiche; for breakfast, lunch or dinner. Your photos are stunning. Oh, feel free to do so. I'm one of those people who are late in following the 'pinterest' trend. I just signed up last week and have not received my invitation yet to this day. The symmetry of the presentation is amazing...I love the tomatoes. I can't wait to bite into the juiciness of the red tomatoes. 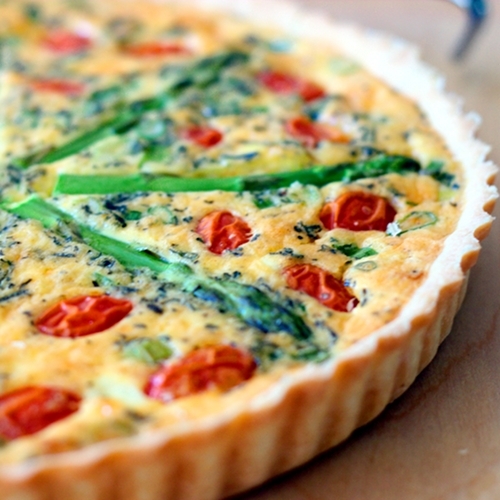 Savory tart is the right way to enjoy a weekend family lunch. Thanks for sharing. Ooooh. this looks gorgeous. I especially love the photos - really beautiful. Can I use a combo of Swiss & Parmesan instead of the cheddar?